Should You Install Halo: Reach to Your Xbox 360? If you're looking to make the most out of your Halo: Reach experience, you might want to save a spare 7GB on your 360's hard drive. Installing games to the Xbox 360's hard drive has always been a bit of a mixed bag. It can reduce loading times for some games, but it can actually make load times worse for some games, too. Booting up a game of Bungie's venerable Halo 3 took longer if you had the game installed to the 360 than if you just had the DVD spinning in the drive. 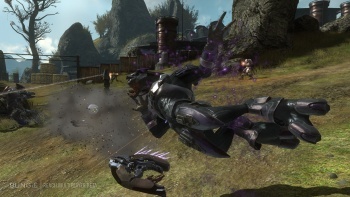 Does Halo: Reach suffer the same fate? No, actually, it doesn't. In fact, a test by The Examiner found that installing the game to the hard drive reduced Reach load times down to as much as a mere third of the original length. The first mission takes 8.1 seconds to load with an install, down from 21.4 seconds without. A Custom game loads in just shy of ten seconds (compared to almost 29 seconds without installation). Even the beefy Firefight mode has its load time cut in half, from 45 seconds down to under 22 seconds. The results are clear, then: If you want to optimize your time spent loading to time shooting aliens in the face, install Reach. That is, assuming you have the 6.6GB on your hard drive necessary for the install. But if you don't, you might have other problems to deal with, anyway.